Be sure you know what you’re doing before you open that first can of paint. Painting is one of those jobs that requires a lot of precision and patience. It’s not uncommon for painting novices to tackle massive DIY projects and be left with a botched job and a lot of frustration. 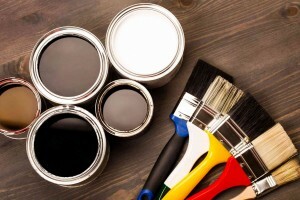 Here are some things you should never do when painting your home. Nobody likes to do prep work. However, if you skip this step you won’t like your painting results either. Before you even consider picking up a brush, make sure your surfaces are spotless, smooth, and all holes are patched up. For outdoor prep, make sure any remaining old paint has been peeled away, any damage is repaired, and the surfaces are spotless. If there is any chance a surface may have been painted before 1980, don’t sand or scrape it. The paint may contain toxic lead, which will become airborne and enter your body if you try to sand or scrape it unprotected. Always get old paint tested for lead before starting to work on it. If you have a live mold problem, it needs to be addressed before any painting is done. While stain and mold-blocking primers will appear to correct this problem, they will only conceal it for a short period of time. First, you will have to stop the source of moisture and then kill all of the molds. Once the mold is gone, you will have to let everything dry completely before you begin priming and painting. Although it is a hassle and may even seem unnecessary, experts know that primer is incredibly important. It sticks well and fills in any pores which can make your paint job look uneven and ruin the entire project. Some people argue that you should use two coats of paint instead of one coat of primer and then paint. However, this is a waste of money, as paint primer is often less than half the price of a coat of paint.